Surgeons could soon eavesdrop on a patient’s brain activity during surgery to remove their brain tumour, helping improve the accuracy of the operation and reduce the risk of impairing brain function. There’s been huge progress in brain imaging and electrophysiology – our understanding of the electricity within our bodies – so why not use this information to improve brain surgery? Patients with low-grade gliomas in their brains – a slow-spreading, but potentially life-threatening tumour – will usually receive surgery to have the tumour removed. But removing brain tissue can be risky as there is no boundary between the brain and tumour – the tumour infiltrates the brain. Removal of tumour can lead to removal of vital parts of the brain and resulting impairments in functions such as speech, movement and executive function (which enables the individual to plan, organise and execute tasks). To minimise this risk, neurosurgeons open the patient’s skull and then waken them. A local anaesthetic means the patient will feel no pain, and the brain itself contains no pain receptors. The surgeon will probe the patient’s brain, applying mild electric pulses to tissue surrounding the tumour while asking them to perform a set of tasks. For example, the patient may be asked to count from one to five: if an electric pulse applied to a certain place in the brain affects their ability to perform this task, the surgeon will leave this tissue in place. While the current approach is considered the ‘gold standard’, it is not perfect. It takes time to apply the pulses on different parts of the brain and it may miss out some areas that are important for certain functions. The current battery of cognitive tests that surgeons use is also limited and does not test for the essential executive function, for example. Now, a team of scientists and clinicians from the University of Cambridge and Addenbrooke's Hospital, led by Mr Santarius, Dr Yaara Erez and Mr Michael Hart, together with Pedro Coelho from Neurophys Ltd, has collaborated to develop a new approach that will enable patients to get a more accurate, personalised ‘read-out’ of their brain networks, and will provide surgeons with real-time feedback on the patient’s brain activity in theatre. Under this approach, patients would undergo a number of neuroimaging examinations using magnetic resonance imaging (MRI) before surgery aimed at identifying not only the exact location of the tumour but also how different regions of their brains communicate with each other. As part of this process, a 3D-printed copy of the patient’s brain will be used, showing where the tumour is located. This model is intended to help surgeons plan the surgery, discuss with the patient the potential risks from surgery and involve the patient in decisions over which tissue to remove. “Doctors need to be able to talk through the options with patients, and we hope that using neuroimaging data and presenting this as a 3D model will help surgeons with the planning of surgery and ensure patients are better informed about the risks and benefits from surgery,” says Dr Erez. During surgery, once the patient’s skull has been opened, the surgeon will place electrodes on the surface of the brain, to ‘listen’ to their brain activity. A computer algorithm will analyse this information as the patient performs a battery of cognitive tests, giving live feedback to the surgeon. This will enable the surgeon to predict more accurately the likely impact of removing a particular area of brain tissue. In particular, executive function is difficult to test using electrical stimulation – in part because it involves networks of regions across the brain. Dr Erez hopes that a combination of improved cognitive tests and a more accurate understanding of an individual patient’s networks will enable surgeons to monitor potential impairment to executive function during surgery. So far, the team has obtained data from 12 patients, already providing a large amount of data to analyse, with a rich dataset from each patient, collected before, during and after surgery. Although they are currently analysing this information offline, the data will help them find the best measures to provide the required information – what the ideal tasks for patients to perform are – and then to optimise the analysis. The research is supported by the Medical Research Council, the Royal Society and The Brain Tumour Charity. Yaara’s background is in Computer Science and Psychology. She spent several years as a software developer before deciding to pursue a PhD in neuroscience, and she is now a Royal Society Dorothy Hodgkin Research Fellow. Her background is proving essential for understanding the inner workings of the brain. Yaara’s interest lies in the brain systems that allow us to behave flexibly, adapt our behaviour to changing circumstances, and select only the information that we need. These systems are involved in a wide range of cognitive function known as ‘executive function’, including problem-solving, keeping focus, switching focus and planning, all of which are essential to normal healthy life. 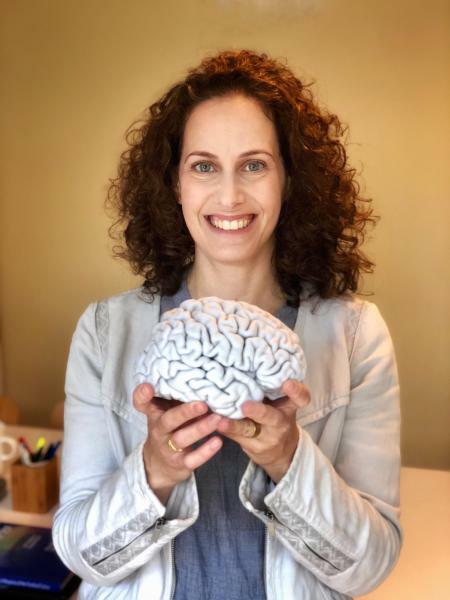 “It’s important to understand these brain mechanisms because it may help us develop treatments for patients with different brain disorders that affect cognitive function, such as stroke, brain tumour, depression, and many more,” she says. Her work uses a variety of techniques that involve different types of brain signals that she collects from healthy volunteers and patients with brain tumours. “This data is very complex, so requires detailed analysis, which I like. The combination of the data from the different techniques, and what we can learn from each of them, makes my work exciting and enables me to get the full picture. Cambridge, says Yaara, is the perfect place for her research. “There are people from all over the world, and they all bring their expertise, knowledge, and perspective. My research is multidisciplinary in its nature, and the combination of the different expertise of people in Cambridge makes it work. We also have great facilities here and are very fortunate to have such a great University Hospital as Addenbrooke’s as our local hospital.